It has been a while since I wrote much about stats in tennis. There are a number of reasons for this, but one being that I was struggling to think of topics to write about. As a result, it seemed like an interesting idea to ask around my Twitter followers for some ideas of what they might like to know. I got a number of responses and have picked a selection of them to answer in this article. The idea that there is plenty of tanking going on the week before a Grand Slam event has been around for a long time. The theory is that higher ranked players will generally want to prioritise the slam events due to the better chance of picking up prize money and ranking points. Firstly, if we address the actual question of whether there are more second set bagels, we find that in ATP events not in the week before a slam, 3.3% of matches that finish in straight sets see a second set bagel. In the week before a slam, 3.0% of matches that finish in straight sets see a second set bagel. There is very little different here, and indeed, we also see virtually no difference in 6-1 second sets either or even the percentage of matches that finish in straight sets. However, one difference that we do see is the number of favourites that lose in straight sets. In an average ATP tournament not in the week before a slam event, we see 45.8% of wins by outsiders being completed in straight sets. However, in the week before a slam, this jumps to 59.1%, suggesting that there may be an element of favourites not putting everything into trying to fight back if they go down by a set and a break. From a betting perspective, can we see any profit in backing against the higher ranked players in this week before a slam? Well, if you had £10 on every match since the start of 2010 where a non top-20 player was against a top-20 player in the week before a slam, you would have won £189.70 at an impressive return of 10.4%. Indeed, if we break this down further, if you had backed non-top 20 players against top 10 opponents, you would actually have lost £46.20. It seems that either the top 10 players only enter these events if they intend to try and win them or that even if the top 10 players are not giving it everything, they are still good enough to win. Instead, it is the players ranked between 11 and 20 that are the ones to oppose in this week - a strategy that would have returned £235.90 from £10 stakes at a 19.5% return since 2010. @sportdw Murray vs Djokovic rally duration. Murray win more of the longer rallies? Novak Djokovic and Andy Murray are arguably the two best returners in the game and their fitness and ability gives them an advantage in long rallies. However, the question of which player tends to come out on top in long rallies between them is an interesting one. We can see that the longer rallies of 10-20 shots, there is virtually nothing between the two players. Of the 452 rallies of between 10 and 20 shots in the 13 matches, we find that both players have won precisely 226 points each. Djokovic appears to have a slight edge on the seriously long rallies, but a sample of only 109 points means that it could be slightly less reliable. 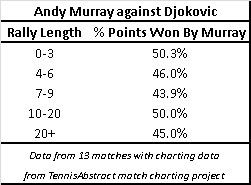 Instead, it is when Djokovic is able to keep the points shorter that he has the advantage over Murray. Of points between 4 and 9 shots in length, Djokovic wins 54.7%, which is a significant difference and is where his success over Murray has come from - Djokovic is able to attack early in the point and end them early. If we look at the ATP, we find that the percentage of players that are serving at the first change of ends in a tiebreak goes on to win the tiebreak on 47.5% of occasions. This could possibly suggest that there is a very slight impact from this. However, if we look at the percentage of points that are won by the player serving at this stage in the point before the change of ends and the point after the change of ends, we see very little difference. The server wins 64.2% of the points immediately before the first change of ends compared to 64.6% of the points immediately after the change of ends. Indeed, we actually see that the percentage of aces increases from 8.0% to 9.6% following the first change of ends and the percentage of double faults drops from 3.3% to 2.7%, suggesting that the slightly longer break may actually benefit the server, giving him the opportunity to focus his mind on his upcoming serve. @sportdw which players have had the largest increase in return points won and if it is sustainable? The top 5 players with the biggest increases in return points won in the top 50 in the world rankings are Guido Pella, Ricardas Berankis, Milos Raonic, Richard Gasquet and Nick Kyrigos. This is an interesting list. Guido Pella has won 6.9% more return points at ATP level in 2016 as he did in 2015, although he only played a handful of matches last year and mostly on his less favoured surface. On clay, he dominated at Challenger level in 2015, racking up a 45-14 record with four titles and he has really carried this form into 2016 reaching the final in Rio de Janeiro, the quarters in Nice and Bucharest and a third round run at Indian Wells. As to whether he can keep up these improved number, it is debatable. He has been very efficient at beating players ranked below him this year with a 9-3 record and 40.8% of points won on return. However, against players ranked above him, he is just 3-8 and 34.8% won on return. So, it seems as though he has a level and while he may be able to keep up his improved return stats, there is not much to suggest that he can improve them significantly more. It is tough to feel that the numbers for Ricardas Berankis have not benefited from the level of opposition that he has faced thus far in 2016. The average ranking of his opponents last year was 66.4 compared to 90.7 this year and in matches where he has won a significant number of return points, he has been aided by very poor first serve percentages from his opponents, such as Seppi's 49.5% 1st serves in Doha and 55.6% by Fritz in Memphis. The improvements on return for Milos Raonic and Nick Kyrgios are impressive though. Two big servers that are still developing their return game, they have both posted significant improvements in their return numbers despite facing a higher average level of opposition in 2016. They are already two of the most effective servers in the game and if they can add an improved return game, they could be very dangerous. However, they are still starting from a low level. Even with a 4.4% improvement, Milos Raonic still only has the 41st highest return points won percentage in the top 50, while Nick Kyrgios' 3.2% improvement moves him to 34th in the top 50. They both still have plenty of time to improve this aspect of their game and I see no reason why this improvement cannot be sustained. How do run-rates change across a T20 innings?